If you need some great slot action with good payout potential, here’s a purple gorilla that’s come to your rescue. 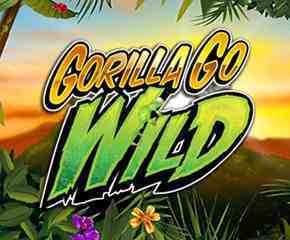 The Gorilla Go Wild slot has your swinging furry pal ready to help you win some cool prizes in this fun jungle adventure. Gorilla Go Wild is prepared by NextGen, one of the leading providers of casino games in the online gambling world. With its cheery and colourful interface, along with some great game features, this slot is one of the best that you can look forward to from this developer, yet. 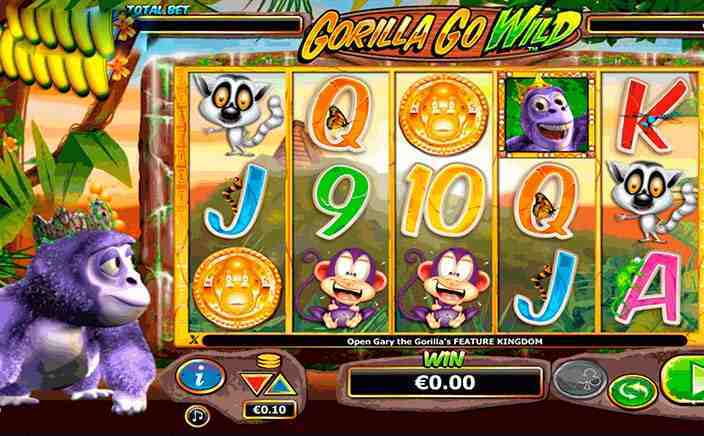 Gorilla Go Wild is a 5 reel and 25 payline slot game that has a colourful jungle theme to it. Your furry purple Gary the Gorilla friend is your central character in the game, and will help you win even more prizes by introducing to you some of the game’s bonus features. The game uses the concept of Evolving Gameplay, which means the more you play, the more fun the game becomes. The cartoony feel of the game also lends it a very exciting air. To start playing, you need to place a wager and then begin spinning the reels. Once you do this, you can see if you get the right symbols to trigger some great returns. Wild symbols: Gary the gorilla is the wild symbol in Gorilla Go Wild. You can use him to swap out other symbols and win some cool cash. Gary goes bananas: This is a random game feature in which a bunch of bananas appear and Gary may or may not eat them up. If he does eat them, you get to see more of the Gary’s Bonus Time feature. Gary bonus time: In this feature, you can get either a cash prize of 50 to 1000 coins, or you can trigger the Free Spins Kingdom feature. Gorillianaire Win Spins: this gives you double of your win amount along with an assured prize on every spin. Stay Wilds spins: When you get the fifth free spin sign, you get sticky wilds on each of the spins.